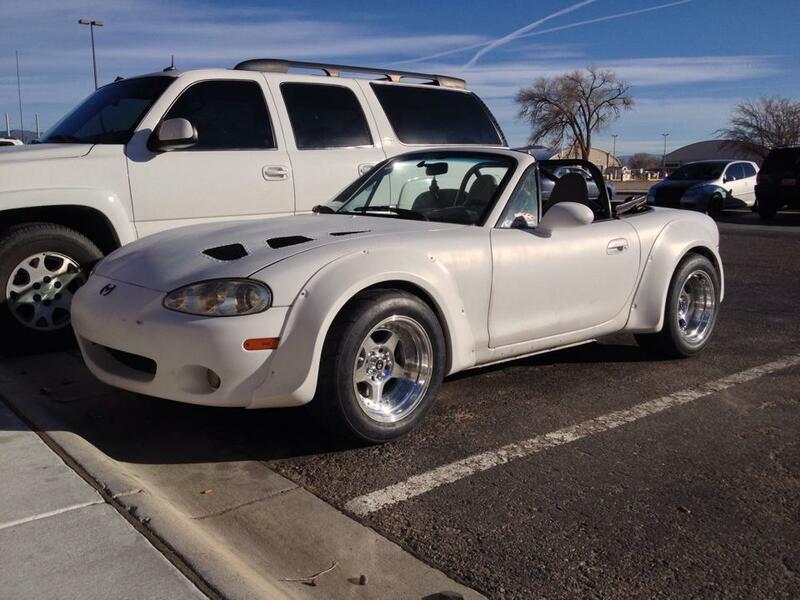 Low Offset Clearance Issues - Miata Turbo Forum - Boost cars, acquire cats. So, I recently put on some Rota Kyusha 15x9, 0 offset in the front and -15 in the rear. Imo they fit perfectly with the flares I've got on, but unfortunately I've had to do a LOT of cutting (to include some big chunks out of the flares *cringe), and I still can't get them to clear all the way. They clear the flares and the old fenders fine now, but once I get close to full lock the back of the tires rub on the firewall. Mostly I'm just wondering if anyone has messed with wheels with this much offset, and what you did to get them to clear properly... I'd like to stay away from tubbing the firewall, but it's looking like that might be the best option at this point, as I don't know if I'll be able to bend it out enough with a hammer (especially considering I'd like to lower the suspension again... had to raise my coilovers all the way up to get the wheels to clear even this much). Here's a picture of the new wheels... I can get some pictures of it with the wheels off if anyone wants, but it won't be 'til next week since I'm out of town for the holidays. Lower. More negative camber and more positive caster. on the other hand, how badly is it rubbing? A little hammering might help without needing to tub. I do plan on lowering it about an inch maybe an inch and a half from where it sits now, but I really don't want to add much more camber than what's there now... what's the point in putting on wide tires if you've only got a sliver of 'em touching the ground? In the future, I'd also like to get some modded knuckles for extra angle while drifting (yeah yeah, super gay, should probably just sell the car to someone who will use it correctly... I know ). I don't think I'll run into any problems except for the firewall... everything else seems like it can either be ground down or it should just clear. Right now it's just barely rubbing... a little more work with the 5 pound sledge and I'm sure I can get them to clear... but that's while it's sitting still. I'd like to get it to a point where I know they'll clear at full lock when the car is leaning hard in a corner. Unfortunately these tires are WAY wider (and taller) than they are rated... they say they are 235s but imo they are closer to 255 (they've got almost no stretch at all on a 9 inch wide wheel). In the future when I need to replace these tires, I'll likely get some thinner ones, but for now I'm stuck with these. Now maybe I'm crazy but... Why not just get some wheels that fit? Looks like a 235/50 R888. It's not a particularly wide 235, but that tire doesn't fit under the car IMO. No matter what you do to rectify the issue at the firewall, they will rub the top of the shock tower and the top of the fender at full bump, which is material that can't be removed without seriously altering the unibody. I can only assume that size wheel is done for aesthetics and not performance. If it was done with performance, this thread will be eye-opening for you. Extreme aesthetics are going to require that you make some usability sacrifices. If they only rub at full lock, consider yourself lucky and don't use full lock. This is more of a tire size issue than wheel size, though i do somewhat agree here. I'm guessing he's running the 235/50-15 R888s, which.... aren't exactly ideally sized for a Miata. edit: Andrew beat me to the punch by a minute. On my 1990 Miata I rolled the fenders hard. I mean really pushed the limits and then some . Pulled the plastic in liner back before hand and ground a lot of extra steal off where they sandwich it and spot weld everything together. Then I ground off some more. Put the plastic inner liner back . Elongated the mounting holes and put the liner behind the fender lip . Then rolled it to pinch the inner liner in place. Has been working for two yeara plus perfectly. Now I then borrowed my buddies 949 racing 6'ul's 15× 9's with some worn out 225/50/15 R1r's . Drove it hard but only on the street . Tried full lock to lock. No rubbing. I have a 99 Bilstien PSS suspension with a racing beat 1 1/8 front bar with bracing , and NO rear bar. 1.2 negative camber up front and 1.7 negative out back. I also have diffusers on my frame rails and those did not have any clearance issues. Tires never rubbed. To center them up I should actually use a 3 mm spacer to move them out a little. I did realize that. I was offering exact fitment info that I know beyond a shadow of a dought will work. His fitment does not work. Every time I'm absolutely right and try to help I get slammed here. Do you really want help or just want to degrade some one who actually spent money and time to do this and make it work and is willing to share All his secrets on something that currently does not work perfectly , yet. I'm just not sure what it has to do with the thread. Wasn't meant to be a slam, just a tongue in cheek "whatchoo talkin bout, Willis?" What fits under a stock body car isnt voodoo magic anymore. Since this car will be smashed in to a wall soon anyways, just take a sawzall to everything that's in the way. Nah, it won't be soon... there's no way I'll be able to spin the tires 'til I get much MUCH more power, and I don't plan on turbo'ing her 'til she has some other things done first (ie. clutch/flywheel, better brakes, seats/harnesses). I'd have no problem slicin' and dicin' if I had access to a decent welder I could use to make sure everything retains it's structure. Let me cast a shadow of doubt for you, then. Had you driven that car hard, used full lock-to-lock steering, and then looked under the car you drove on 15x9 6ULs with 225/50 tires, you would have found tire marks and/or rubbing on the upper shock tower, the top of the inner fender, and contact at the FSB from the tire at full lock. 225/45 tires leave all these same marks, but it is a light brushing of rubber and nothing to be concerned about. The 225/50 tires, however, are a full 1" taller, and will contact all of those places significantly. The FSB isn't a big deal (don't use full lock), but the rubbage at the shock tower and inner fender would be significant. If you didn't see these marks, you either don't have the car low enough or you didn't drive the car hard enough (or you didn't look hard enough). 225/50/15 tires do not fit this car. Anyone with any real experience setting up a Miata will tell you this. 225/45s fit the car perfectly, OTOH, so I'd suggest using them. Well, my car usually sees full lock whenever I'm pulling in/out of a parking spot, so since this is my DD for the moment, this situation has a lot more to do with it than just my UB3R 1337 D0R1FuT0 skills. I'll definitely be putting a smaller tire on the front in the future, but I'm determined to make these work... they're already pretty close, so I don't think it'll be TOO much work. So you did all of this to your dd? And you also plan to modify the spindles for more angle when they rub already? And you plan to "drift" this car that you dd? And you put giant grippy tires on the back of an underpowered car in hopes it will break traction easily to actually be able to drift? Where the **** is that ROFL smiley? So you did all of this to your dd? Yes. Yes I did. And you also plan to modify the spindles for more angle when they rub already? Mhmm. I also plan on putting on smaller tires, and doing other supporting mods (lolsledgehammer) to gain the clearance I need. And you put giant grippy tires on the back of an underpowered car in hopes it will break traction easily to actually be able to drift? No, I put the tires on in hopes that I will no longer be able to break traction. If I were to take it out for a drift session, I'd definitely put a set of smaller (and significantly cheaper) tires on. Same place as the rest of the smileys, but if you're having a hard time finding it you can always just type in "rofl" in between a set of colons.